2019 summer camp from june 17th through aug 23rd! STEM based Robotics Program with lessons on Self-Defense and Nunchuck! Get FREE Taekwondo Costume and Nunchuck ($40 value)! Grades K – 8 Mon through Friday every week during Summer Break. Full Day / Half Day options available. A camp designed to help campers learn basic Robotics where they build a new functional Robot to solve real life problem every session. Where they learn problem solving and critical thinking. Where they learn to work as a team to accomplish the give goal! 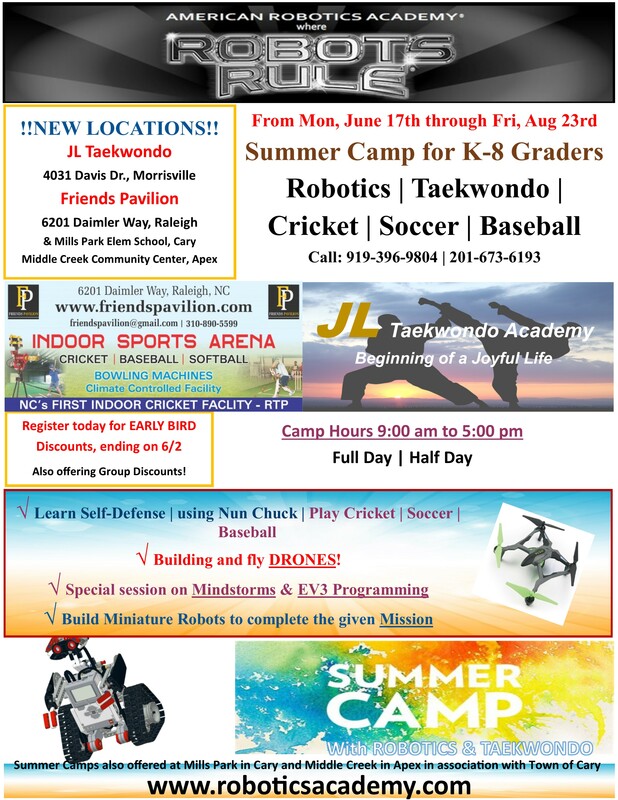 In addition to learning the science, math, engineering and tehcnology aspects of Robotics, campers will spend time learning Taekwondo – Self-Defense and Nunchuck! A well rounded summer camp that meets level of excellence! A monthly program, designed to prepare the kids for FLL competitions. Build wild and whacky Robots, design and build missions based on themes, automate your Robots using EV3 program and much more!!! Hands on Robotics session every week where the students will learn advanced Robotics Engineering concepts and programming concepts. Each program completes in 8 weeks after which the students progress into next level upon renewal. Get excited, inspired and motivated about the importance of robotics technology. Our hands-on classes offer an introduction to the fundamentals of engineering design, helping children understand “how things work.” Held in a friendly, sports-like atmosphere, students work in age-appropriate teams and learn how to design, build and test remote-controlled miniature robots. We use simple, motorized machines – all made from LEGO® bricks! – to demonstrate mechanical movements and other effects. EV3 Mindstorms Programming for students who have completed L3 program. New Advanced builds for all levels. Also introducing Intermediate level builds. Grades K – 2 Every Tuesday 2:30 pm to 3:30 pm from 4/16/19 to 4/11/19. Offering all levels (L1, L2 and L3) and now offering three new levels under Fundamentals and Intermediate program for those who have completed all three levels under Basic. Basic Robotics, Advanced Builds, EV3 Mindstorms Programming and lot more, now in your backyard! American Robotics Class location too far for you? No problem, we can come to your community and conduct classes there. 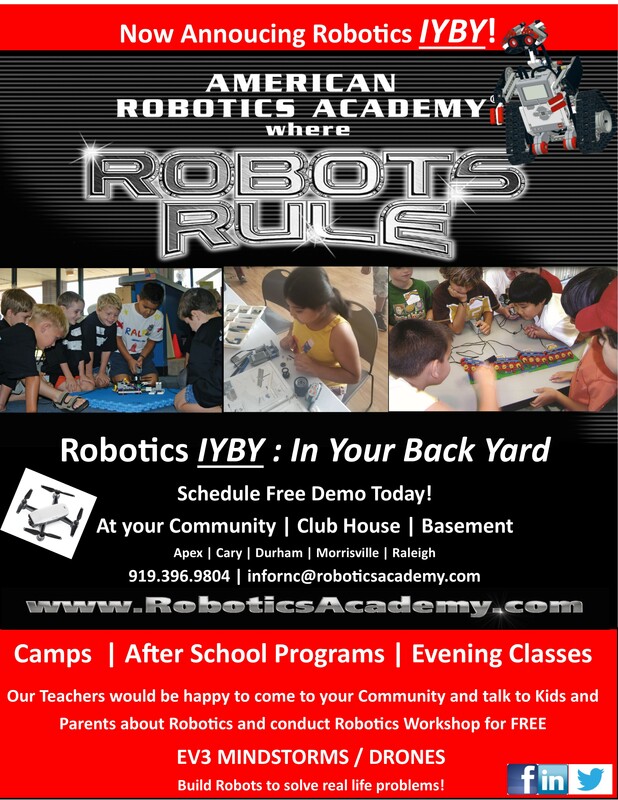 Contact us at infoRNC@roboticsacademy.com for more details about our IYBY program! Contact Deepa to host a Robotics Workshop in your community. Our teachers will come onsite with a workshop program tailor made for participating kids. Our parties are 2 hours @ $300.00 for the first 15 children (an additional $15.00 per child over 15). We provide the Lego kits and only need for you to supply tables and chairs. The birthday child gets to pick his favorite build and receives a free “Robots Rule” T shirt. Depending on how many children attend we will send one or two instructors. They will build then battle the full 2 hours. We do require a $50.00 deposit to book your party. Contact us if you would like to host a demo sessions where we will demonstrate key elements of our Robotics program.